If you want an online slot that’s going to transport you to the land of bright lights, casinos and desert sun (sorry, Blackpool, that’s not you), chances are you’ll be in good hands with an IGT game. The leading slots developer IGT have been around for years, and top IGT games like the Egyptian-themed Cleopatra can be found the length and breadth of gaming floors the world over. IGT’s online games tend to have fairly basic reels, sound FX that put you right in the middle of that slots floor in the Mirage, and generous – if unspectacular – bonus rounds. 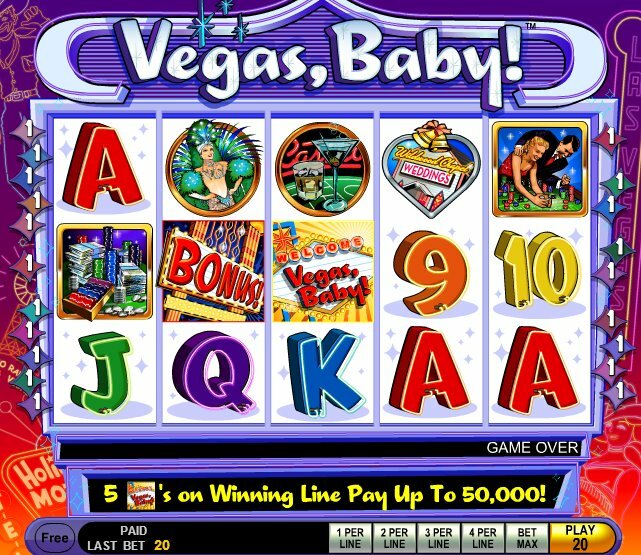 Vegas, Baby - a 5 reel, 20 fixed payline game from the legendary developers – is no different, and with its classic Vegas theme you can close your eyes and think of The Strip. As mentioned, the pay-lines are fixed, and betting starts at $1 a spin so it pays to know that you’ll be dipping into your pockets to play this slot. The game takes you back to the Vegas of old, before the super-casinos and Phantom of the Opera took over: a Vegas of the Rat Pack, gangsters and show tunes. A nice ‘50s jazz riff plays whenever you hit a winning combo, and the reels are packed with neon signs, showgirls, dressed up punters at the roulette tables (no socks and sandals here) and cocktails. The standard 9-through-Ace symbols fill out the reels. The Welcome to Vegas, Baby symbols act as the game’s Wilds, and will double any win they help create on the reels. 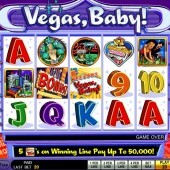 Five Wilds across the reels pays out a juicy Vegas-tastic jackpot of $50,000. Look out for the Vegas Bonus Scatter, as three or more of those anywhere on the reels triggers a free spins round with 15 freebies and a 3x multiplier attached. That may sound pretty sweet but I still found it hard to trigger most of the time. While a simple free spins round won’t exactly set the world alight, the atmosphere of Vegas could be enough of a draw to make you play at Vegas, Baby. For similar Vegas thrills, meanwhile, check out the lush 3D offering from Sheriff Gaming, Las Vegas Fever, while the similar 3D excitement of Betsoft Gaming’s gambling-themed Mr. Vegas may be enough to make you book a flight to Sin City straight away.